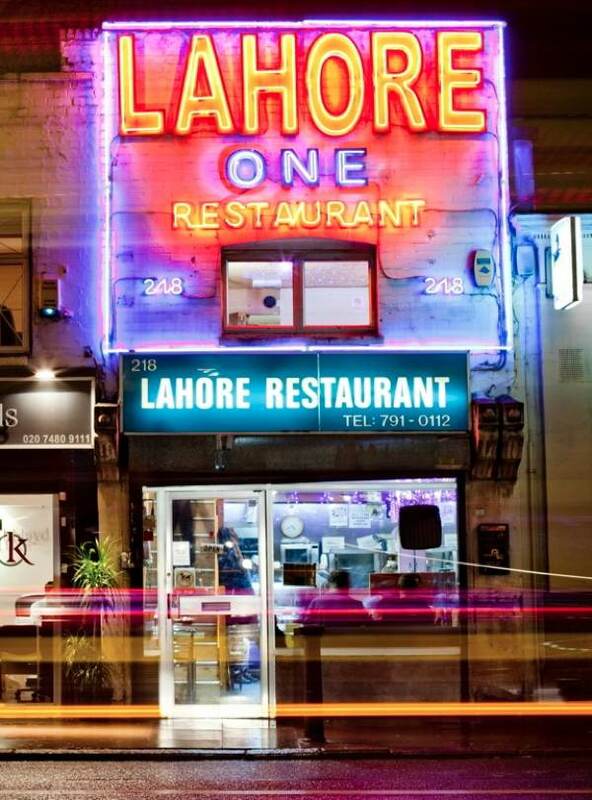 When I first lived in Whitechapel in the mid nineteen-nineties, the Lahore restaurants were some of the best eateries in the vicinity. I remember around that time that my father stopped off at the Lahore One Kebab Restaurant on a road trip to Mecca with a group of fellow pilgrims. Years later, when he was dying, I took him there again. He could never get rid of the memory of those kebabs, and he enjoyed one of his last meals at that restaurant on Commercial Rd. Revisiting it, I find that little has changed – on the outside, at least. 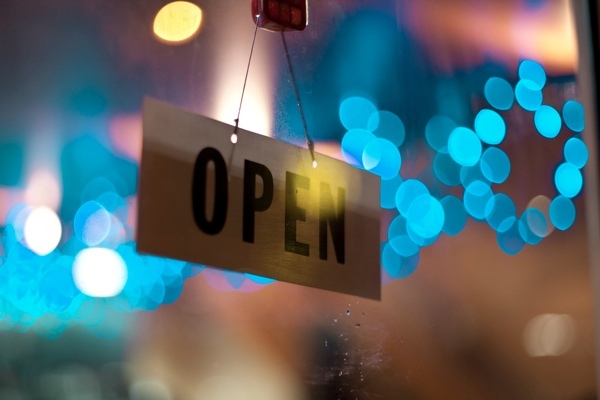 The dazzling neon sign sits above a modest frontage, displaying a couple of favourable press reviews and the menu. When I step inside, I see that the interior has been transformed. The Formica tables have gone, replaced with modern ply and steel ones, and matching chairs. The halogen lighting is bright, the plywood clad walls homely, yet sleek. No flock wallpaper in this establishment. Fragrant smells curl out from the kitchen. 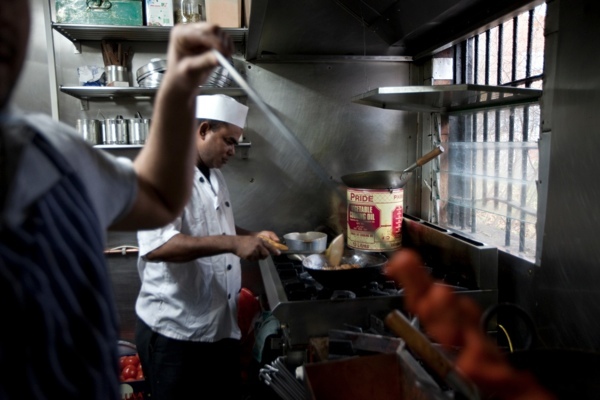 Ali, one of the waiters, from Sialkot, Pakistan, is getting ready for the lunchtime rush. He was not always a waiter, he confides, but a former newspaper man at the Jhang newspaper in Pakistan before coming to England. Clearly he is a seasoned multi-tasker, setting tables, attending to customers as they arrive, while stopping now and then to discuss the troubling situation in his home country, citing the resurgent Taliban and the lack of decent education for its burgeoning young population. The lunchtime crowd are gathering. Nestled around a cosy booth sit four guys; two younger, two elder. They pore over the menu, joking and chatting. I ask them where they are from – meaning which neighbourhood of London. “You’re not from India, you’re from Essex,” says Andy White Patel, the elder man beside sitting him. Much laughter. 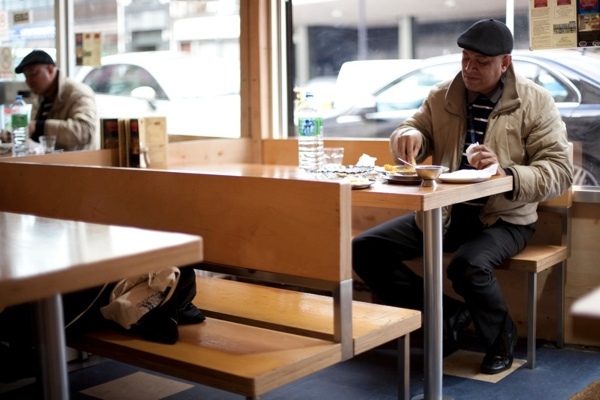 Rahul is lunching with his father, Rajesh, a newsagent in Watney Market. Rahul’s mate, Quyum, works in the rag trade. They are regulars here. Andy White Patel tucks into chicken biryani. 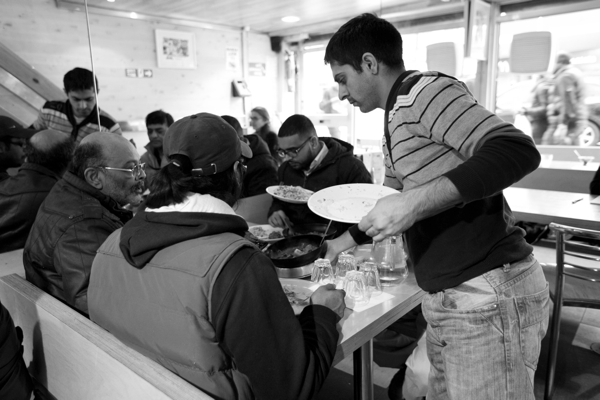 Normally they get kebabs, they tell me, or the famous chicken tikka roll, but today they have a bit more time. Hence the fancier choice. The restaurant was established in 1984 by Mohammed Anjum. Smartly dressed in open necked checked shirt, Mr Anjum emanates confidence and authority as he oversees his highly successful business. He was born and educated in Lahore, Pakistan, and arrived in London in 1981 as an electrical engineer, with the intention of pursuing further study. But he ploughed another course instead; the food business. 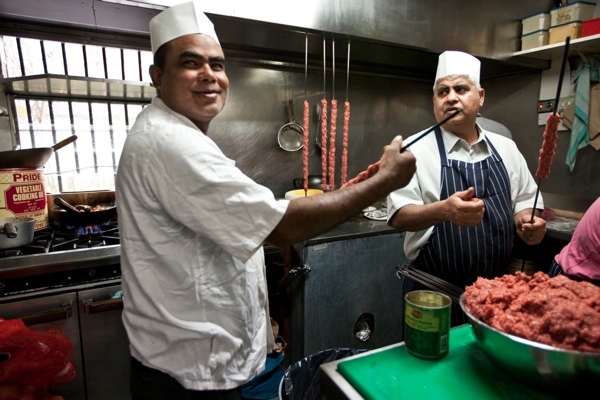 Proper Lahore cooking, he explained, should be like home cooking. Cities like Lahore, Lucknow, Benares, Hyderabad, are all synonymous with great cooking, and that was what he saw he must tap into. This was the task and the challenge he set himself, helped by what he learnt from his mother-in-law who taught him the art of creating home cooking rather than traditional ‘Indian restaurant’ food popular with Brits: Madras and Vindaloo curries, chicken masala in bright orangey sauce. Mr Anjum muses that many Asian people have moved out to Ilford, Chigwell and beyond. But he has stayed locally, living close to the Royal London Hospital. 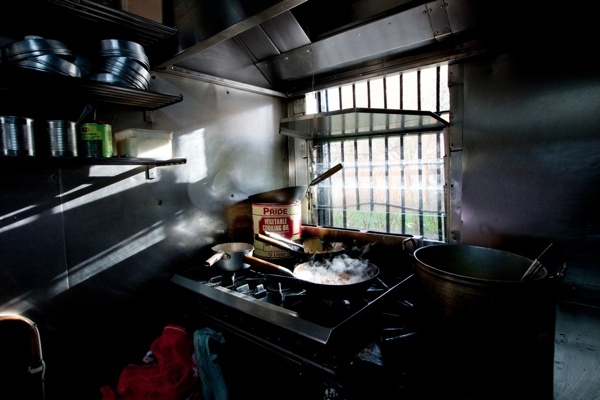 He implies that this is a more modest choice, he has chosen to spend his money on educating his children, a choice that sets him apart from some of his peers running similar eateries in the area. 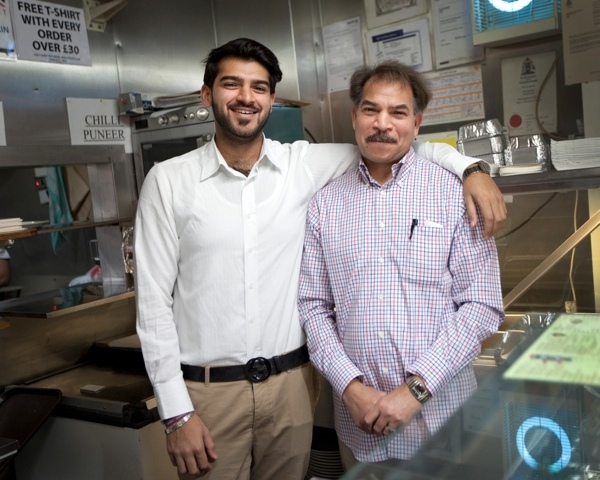 “They prefer to open more and more branches,” he says, “and want their kids to go into the business.” Mr Anjum had other plans for his four children. His two sons were educated at City of London School for Boys, and St Pauls. His eldest daughter is at UCL, though considered Cambridge University, plumping to stay in London. Raj, one of his sons, is studying and working part time at the Lahore One. Mr Anjum is clearly a dedicated and very hard worker himself. The restaurant is testimony to that. This autumn he took his youngest son up to Oxford, where he is now studying geography. Mr Anjum was the son of a graduate stenographer, who worked at Grindlays Bank, during the days of British rule in India. He quickly realized, in that environment, that an education is all important. As did his son, years later, bringing up his children and running a business in the modern East End of London. I want to hear about the legendary menu. 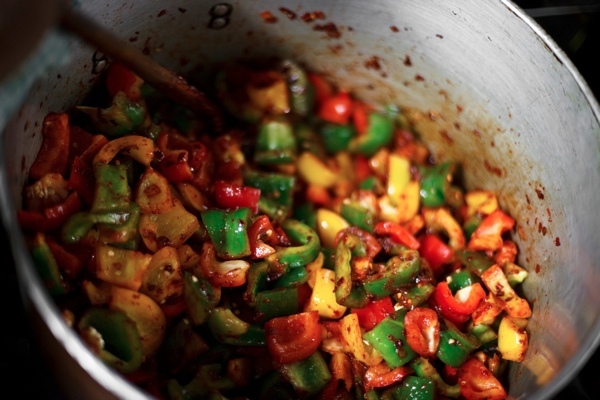 What is so special about it and how it is distinguished from traditional Brit Indian restaurant food? The restaurant uses boneless chicken not minced up in a machine for ease of production, like so many restaurants in places like Manchester and Birmingham. 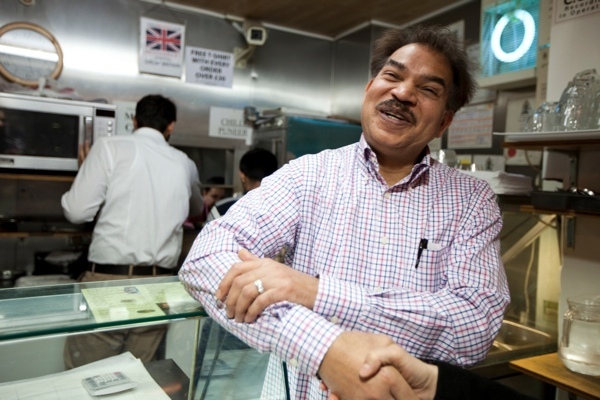 Mr Anjum describes his food with passion and affection. 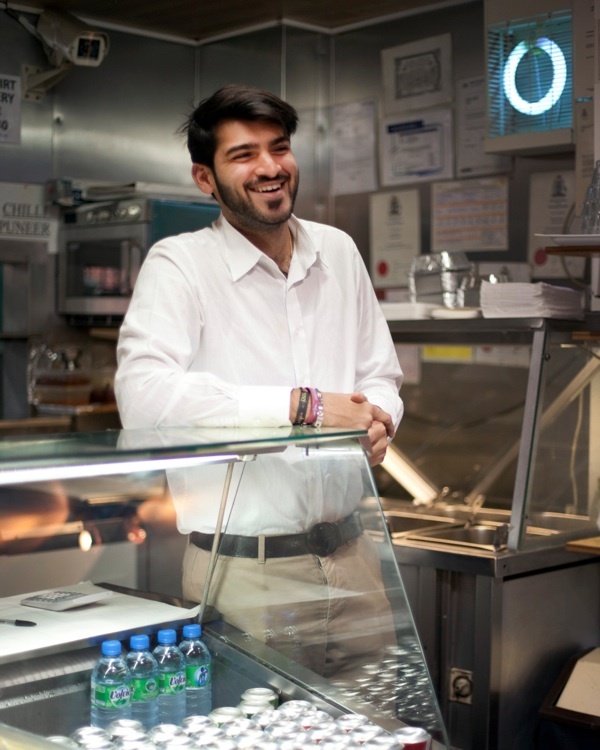 He remembers how he catered a wedding party in Brighton, serving his signature Lahore chicken, which was recognized by one of the guests who used to frequent the Lahore One when he was younger with his father. I do not blame him. A great place for dinner or, if you are Harris, a first date. 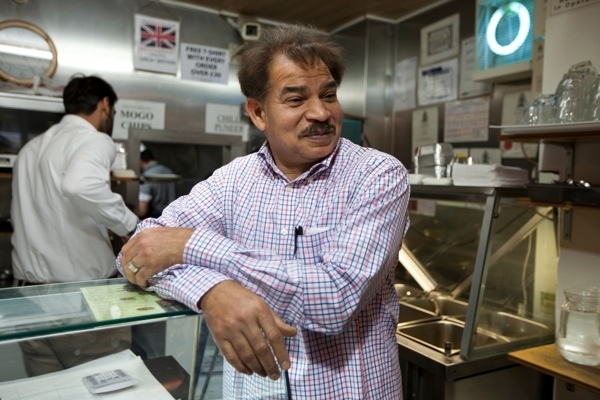 Mohammed Anjum founded the Lahore One Kebab Restaurant in 1984. Is this restaurant different from the Lahore Kebab House? Could you give the address of this one please. Your description makes me want to go there right away! I went to the Lahore in the late 90′s when they still had the formica tables – loved the cafe feel of the place and the food was excellent! Must go again sometime soon. Look at street view, Lahore dead-center. Thank you Rosie. I look forward to reading your next post tomorrow. Really enjoying your articles – Keep them coming! Hope you get a regular slot. My husband’s favourite curry house. In fact he loves going there so much that he had his stag party there 10 years ago! Great article.